The 2014 MTV VMAs took place tonight in Los Angeles with a red carpet that provided an entertaining show - perhaps even more entertaining than what happened on the stage itself. Instagram was of course full of folks, celebrities included, sharing moments on the red carpet, from the stage and behind-the-scenes. 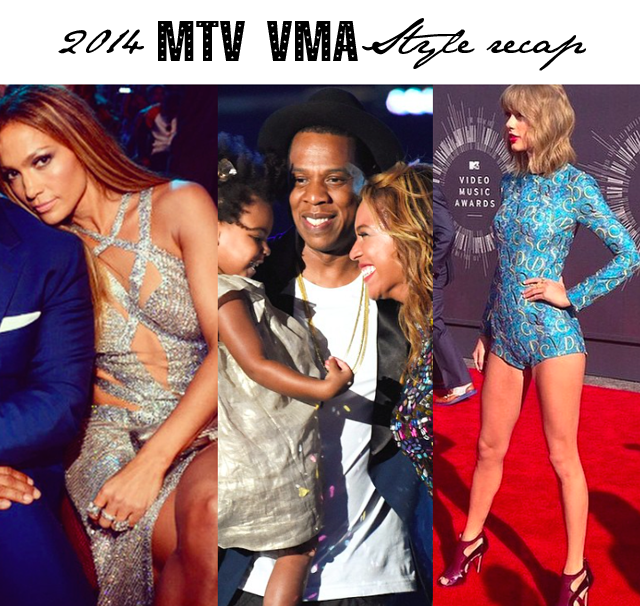 So in keeping with giving you the best recaps of social coverage, here's a look at the 2014 MTV VMAs, through the eyes of instagram. We have, in picture order below: Rita Ora in Donna Karan Atelier; Miley Cyrus in Maison Martin Margiela; Taylor Swift in a short shorts jumpsuit; Beyonce looking amazing on the red carpet, as expected; Katy Perry and Amber Rose channeling old school VMA fashion; J Lo and Gwen Stefani sharing a seated moment; The Kardashians, naturally; Miley Cyrus, again, posing with Snoop - random; a bit of Charlotte Olympia shoes style spotting; supermodels in action on the red carpet; and, finally, celeb newlyweds share a red carpet moment; . And I had to close with an image of Beyonce and family - working hard to prove the split rumors wrong. In short, this was a VMAs to remember with a lot of red carpet moments you'll be reading about all day.